What is it with actors thinking they can also be pop stars? (Of course, the same can be said of singers thinking they can act, but let's leave that for another post). In the '80s, a rash of leading men released singles - including big names like Don Johnson, Patrick Swayze and Bruce Willis, as well as soap stars like Michael Damian and Jack Wagner. This week in 1986, arguably the world's top comic actor at the time debuted on the ARIA singles chart with his first foray into serious pop music - as opposed to the comedy records he'd released earlier in the decade. The biggest shock of all? The song was actually good. Meanwhile, after just one week at number 1, Dionne Warwick & Friends made way for Billy Ocean's "When The Going Gets Tough, The Tough Get Going", which ascended to the top for a six-week stay. Charting for one week before re-entering in May was this slice of pop/funk from the British singer who also worked with Stock Aitken Waterman on a couple of singles, including one later covered by Kylie Minogue. The third and final single from Fly On The Wall would also be included (in remixed form) on the upcoming Who Made Who album, which also contained the song that'd finally give AC/DC another hit. Eight years after their debut single, indie faves The Go-Betweens finally cracked the Australian top 100 with this first single from Liberty Belle And The Black Diamond Express. Like The Go-Betweens, The Church were another popular Aussie indie band, albeit one that'd experienced significantly more chart success up until this point. But, it'd been four years since their last mainstream hit and "Tantalized" became their latest single to undeservedly miss the top 50. It was lifted from Bryan Adams' Reckless album, but rock duet "It's Only Love" came with a music video featuring footage from Tina Turner's Private Dancer tour. Bryan had popped up at one of Tina's shows in Birmingham, UK to perform the duet - and the occasion was capture for posterity (and home video release). The concert recording didn't sound that different from the studio version, which had a raw, live feel to it already - and I can't say that it's one of my favourite tracks from either artist. The novelty of the duet was enough to help "It's Only Love" out-perform Bryan's previous single, "One Night Love Affair", but not enough for it to dent the top 50 - not that surprising given Reckless had already spent 45 weeks on the albums top 50. The song was, however, a number 15 hit in the US. As the fourth and final single from the already chart-topping Be Yourself Tonight album, "It's Alright (Baby's Coming Back)" was never going to be massive, but the understated synthpop song ended up as Eurythmics worst-performing top 50 single since their 1983 breakthrough with "Love Is A Stranger". 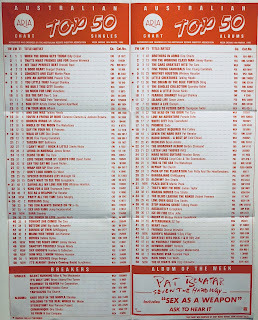 In fact, assuming "Julia" was never released in Australia, "It's Alright..." was their first release in all that time to miss the ARIA top 20 - and would remain their career low-point until beaten by "Shame" in early 1988. The momentum had been building, and after a run of ever-improving chart positions (including for an early release of this song), "How Will I Know" became the track to finally turn Whitney Houston into a major star in Australia. A far cry from seductive ballads "You Give Good Love" and "Saving All My Love For You" (which bounced back up the top 50 this week), the joyous pop of "How Will I Know" was hard not to like. The track was composed by George Merrill and Shannon Rubicam (aka Boy Meets Girl), the songwriting (and romantic) partnership who'd also provide another of Whitney's big '80s hits, "I Wanna Dance With Somebody (Who Loves Me)". "How Will I Know" had been intended for Janet Jackson, who turned it down, feeling it was too lightweight for her - but the frothy pop concoction was just what was needed on Whitney's ballad-heavy debut album. Add some magic from producer Narada Michael Walden (who did enough to warrant a co-writing credit), and the song became Whitney's second US number 1 and almost reached the top here. Here's another act that was - on a slightly lesser scale - just hitting its stride. After placing two singles in the 50s in 1982, Melbourne's Hunters & Collectors had a string of chart misses, including the original 1984 release of "Throw Your Arms Around Me". This lead single from the Human Frailty album changed all that, with the aggressive-sounding rock song about a fight between a couple working its way up into the top 30 and remaining their highest-charting effort for the next three years. By contrast, next up we have a band facing a downturn in their fortunes as this second single from Once Upon A Time became the first of two consecutive number 46 hits for Simple Minds. As with Hunters & Collectors, it would take until 1989 for the Scottish band to do better than this. 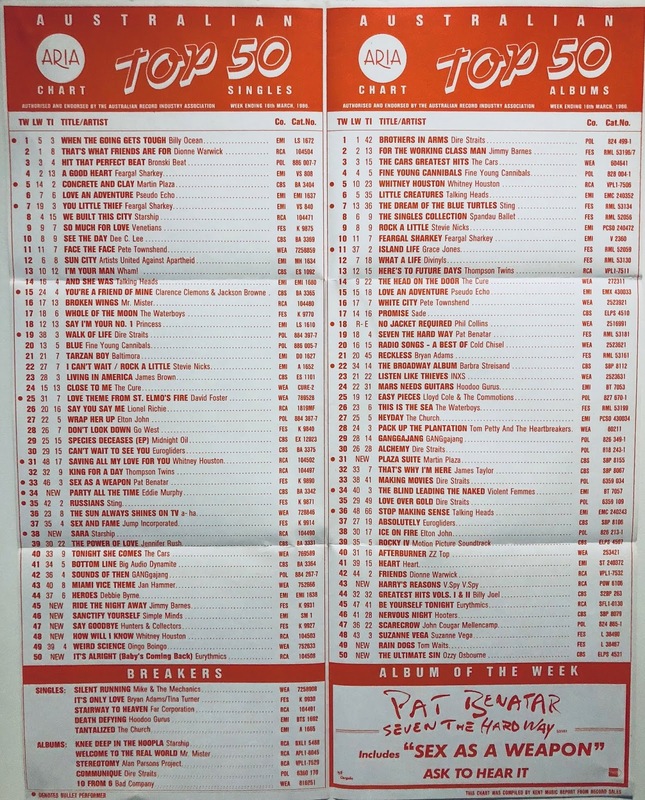 Bad news also for Jimmy Barnes - after two back-to-back top 10 hits, the latest release from For The Working Class Man bombed out at the lower end of the top 40. Co-written by E Street Band member Steven Van Zandt, "Ride The Night Away" no doubt suffered due to its parent album being one of only three releases to sell enough copies in the previous 10 months to dislodge Dire Straits' Brothers In Arms from number 1. It also wasn't one of Jimmy's best singles, with the "Riiiiiiiide" in the chorus constituting everything I didn't like about his vocal delivery. After that raucous rock anthem, let's cleanse our palates with a smooth mid-'80s power ballad courtesy of recent chart-toppers Starship. Another number 1 single (following "We Built This City") for the recently revamped band in the US, they had to make do with a top 10 placing in Australia. "Sara" was written by another husband-and-wife team, Peter and Ina Wolf, and named after the real-life spouse of Starship singer Mickey Thomas. In the music video, he appeared alongside Rebecca De Mornay, who'd starred in a a progression of flop films since 1983's Risky Business. He'd released two albums already - and even won a Grammy - but in 1985 the star of Beverly Hills Cop, 48 Hrs and Trading Places went from putting out comedy records to selling himself as a fully fledged pop star. And the public bought it... for a short while. Eddie's debut pop single (as opposed to his previous single release) went to number 2 in the US and almost made the top 20 in Australia. 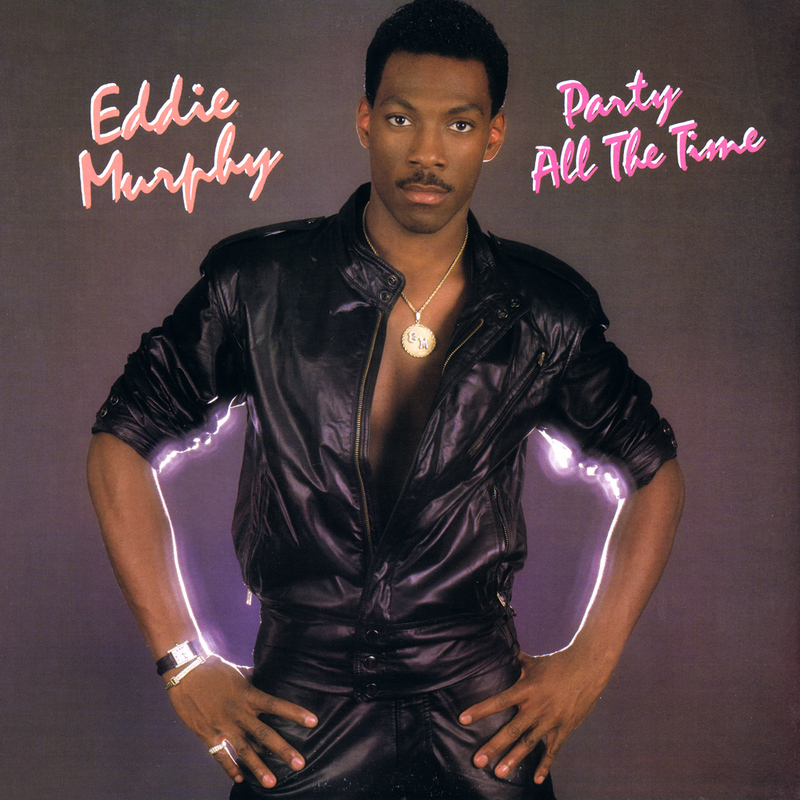 On "Party All The Time", Eddie had a little help from Rick "Superfreak" James, who co-wrote and produced the track. The funk performer's involvement was made very clear, with Rick featuring prominently in the recording studio-set film clip - a video concept that also served to reposition Eddie, because nothing says "I'm a serious artist" more than showing yourself making your music instead of clowning around. Eddie's top 50 success in Australia was short-lived, but he managed another hit in the US in 1989 with the elegantly phrased "Put Your Mouth On Me". Next week: two performers that released a duet together in 1985 debut with new singles, plus the first chart appearance by one of the best-known songs of all time (but not by the original artist) and another member of Genesis hits the chart away from the band. I hadn't heard 'Roses' before. I like it. No-one would be given 8 years to score their first top 100 single these days. A Eurythmics megafan I know says 'Julia' wasn't released locally, but 'This Is the House' (whose Oz catalogue no. places its release after 'Sweet Dreams' and just before 'Who's That Girl'), which failed to chart, was. 'It's Alright...' seems like it did better than #32, but something about its production makes it sounds like it was already 3 or more years old at this point, to my ears. It's difficult to picture Janet singing 'How Will I Know', given how weak her voice is compared to Whitney's. It must have had a serious re-write. 'Say Goodbye' really should have been titled 'You Don't Make Me Feel Like I'm a Woman Anymore'; almost a follow-up to 'You Make Me Feel Like a Natural Woman'. I'm shocked that 'Sanctify Yourself' only peaked at #46. I thought it was a much bigger hit. I remember seeing the 'Sara' and 'How Will I Know' videos on TV before school. I don't think I heard 'Party All the Time' until early this decade, but it's decent. Worthwhile for watching Rick James' hair in the video alone.